I was at a cat shelter building workshop today organized by Toronto Street Cats. The workshops were held every two weeks throughout the fall and winter season in the garage of the Toronto Humane Society ... today was the last one of the season. I've been going since November ... it's so nice helping the kitties in Toronto keep warm and dry during the cold winter. 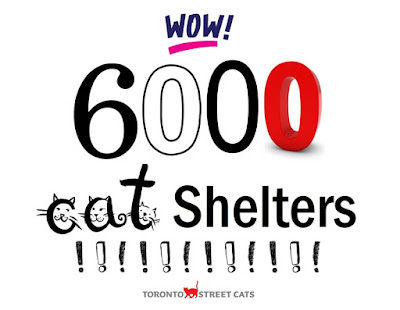 Since the January 9th workshop, Toronto Street Cats was able to sell over 160 shelters (yay!) and were down to 50 in stock. I started with taping discarded pieces of insulation together so they could be cut into bottoms. Thom drilled entrance holes into the bins. He had a fun eclectic playlist ... Lady Gaga, bagpipes, Johnny Cash, Patsy Cline! Then I started attaching the entrance tubing. The bins were filled with straw. The shelters are available to caretakers and colonies in need for $15 and refurbished ones are $5. After eight years of building shelters, Carol from the Toronto Street Cats celebrated making their 6,000th shelter! In the 2018/19 season, 700 shelters were made and 6,040 have been made since they started in the fall of 2010! Congrats! Yay: congrats to all of you!